I don't know, but this looks like some kind of fungus or other parasitical plant. It, and others, are growing on the stems of brambles and other plants out by the vineyard. They're pretty, but they don't look like they belong to the plants on which they're growing. They could also be some growth of the host plant that's protecting an insect's eggs or larvae. 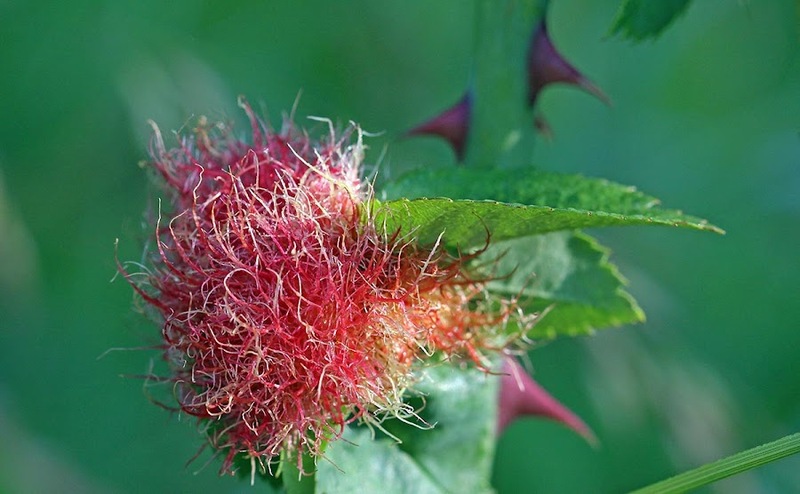 **Susan and Tim tell me that this is indeed a gall caused by the larvae of a wasp. See the comments for more detail. Thanks S & T! It didn't rain much on Saturday, but we had a lot of drizzle most of the day. Later in the evening the sun broke through a bit and we were able to sit out on the deck for a while. Now we're looking forward to a few days of nice, warm weather. Nothing like the heat wave they're having in the southwestern US, though. Poppies! Poppies will put them to sleep... These, however, aren't the right variety of poppy for that. Those would be the larger pavots or opium poppies. This variety is commonly called coquelicot or the field poppy, and it grows wild in a large part of France. In late spring and early summer, whole fields of these flowers paint the landscape bright red. 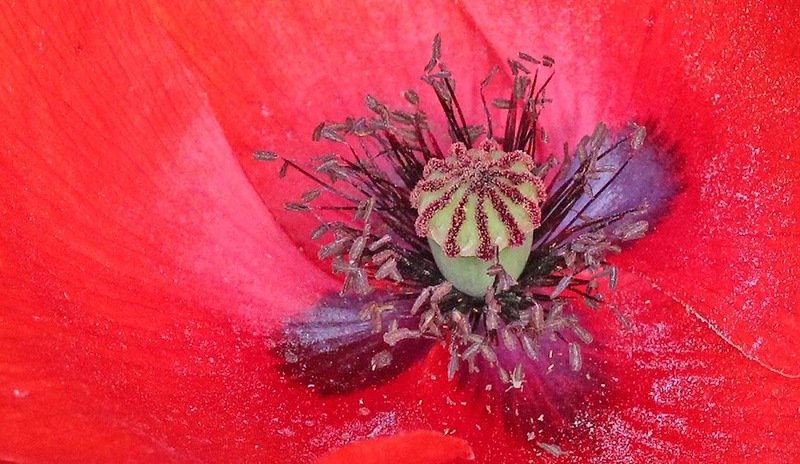 The center of a field poppy's flower. It looks like something out of the Land of Oz, doesn't it? A small batch of these poppies "popped" up next to our hedge along the road this year. I'm hoping to encourage them to spread by collecting and redistributing the seeds when they're ready. Our weather is about to change and we're expecting a week of warm summery weather. Yippee! Our spirits will be lifted and the vegetable garden will get a good dose of warm sun. We all need it. I spent Thursday morning doing what's become an annual chore: cleaning the drains. All the "gray" waste water from our house drains down into a settling reservoir in the utility room where it then exits the house into the sewer system. You may recall that the sewer line in our neighborhood is pretty new, having been put in in 2006. Before that, our gray water drained into the vineyard and eventually to the river. Yuck. 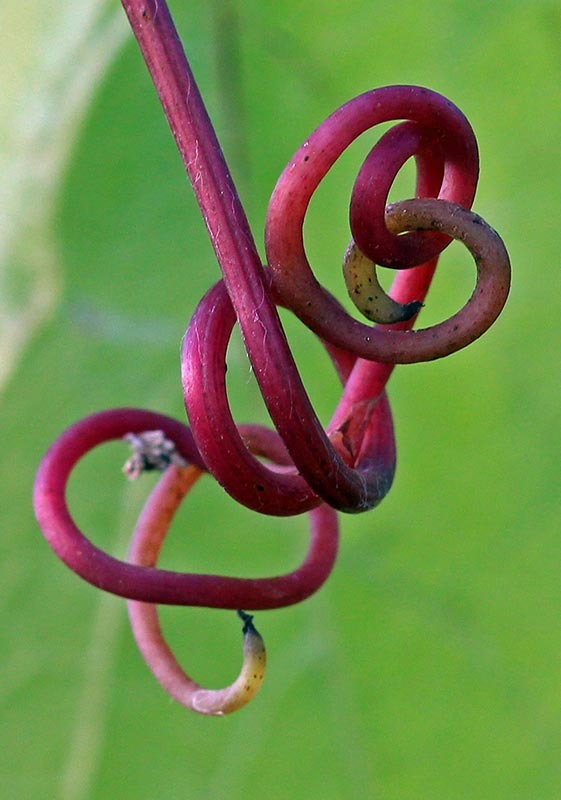 Curly vine tendrils making their way around a leaf. The concrete pipes that run through the slab our house sits on can accumulate gunk and deposits from our relatively hard water and blockages form slowly. So, once a year, I snake them out to keep them running. We had recently noticed a smell in the utility room and when I removed the cover of one of the access points, sure enough, there was yucky water accumulating. I got the power washer out along with the drain-snake attachment and went to work clearing the blockage and cleaning the drain system. Now it's running normally again. By the way, human waste does not go through this system; the toilet has a pipe that runs directly into the sewer line separately. I don't have to mess with that. Sorry, I couldn't resist. I won't go on about the US Supreme Court's decisions on Wednesday, which I'm obviously happy about. There is much reading to do now to follow and understand the practical implications of these historic rulings. 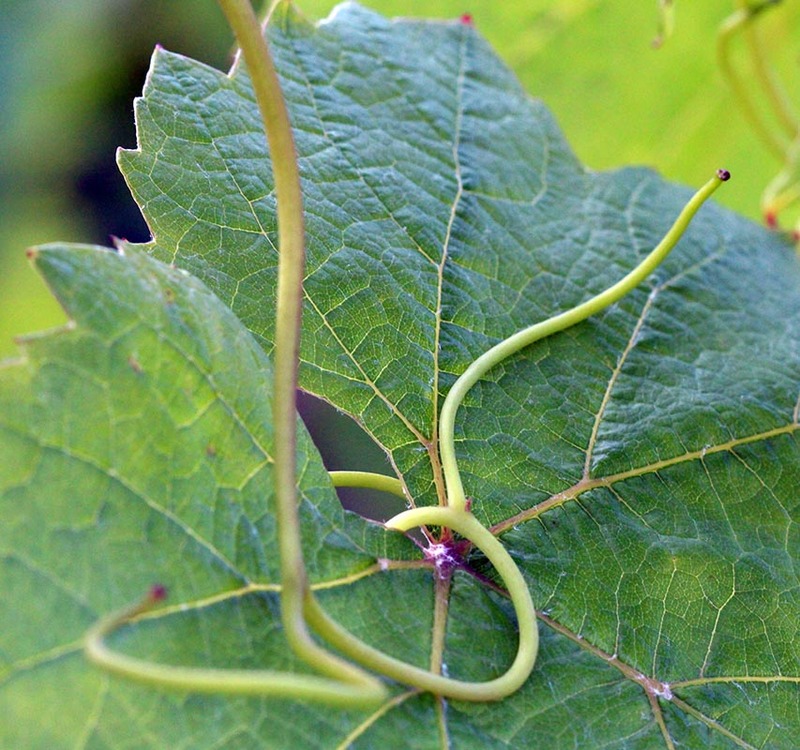 More grapevine tendrils. These are part of this year's new growth. We had a beautifully sunny day yesterday. I got a load of chores done in the garden, but the list is still long. Today the overcast is back, but we are in a gradual warming trend and that's a good thing. The roofer we hired was here on Tuesday and spent about four hours working on our repair. He said that he's not sure what he did will work, but he didn't want to do the larger, more expensive job until after he tried it. Baby steps. We're hopeful. Now we need some hard rain to test it, but I'm in no hurry for that given all the rain we've had this year. 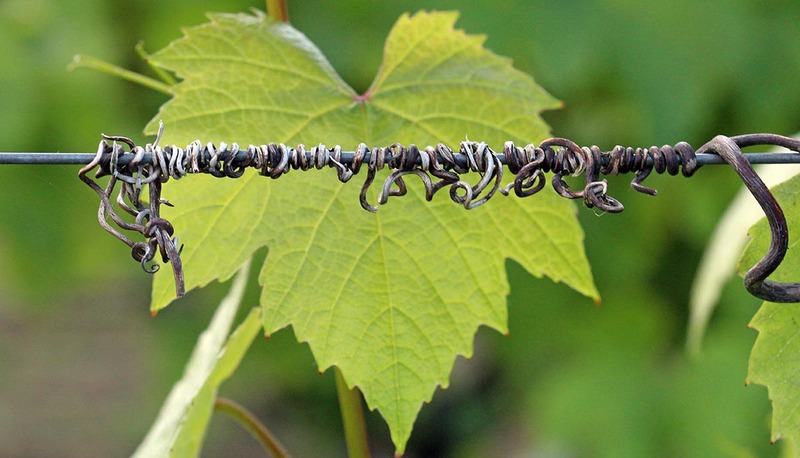 Last season's dried vine tendrils with this year's new growth. The grapevines are flowering now. Our weather is still chilly for the season, but we're getting a little sun now. I've got a lot to catch up on outdoors. Yesterday I got the grass cut. The list of chores is long, so I have to pick one or two things to get done today and do them. It always feels good to get something accomplished. On Monday's evening walk in the vineyard, I was greeted by this sight out toward end of our route. Callie was sniffing around some trees and did not see the deer right away. I was able to snap a few pictures before a car came by and scared it. Callie noticed the deer as soon as it moved and was off after it, but it was quickly into the adjacent woods and gone. A chevreuil kept its eye on me while standing perfectly still before it bounded away to the left. Luckily, Callie gives up the chase rather quickly and we were soon on our way. These chevreuils (roe deer) are common around here. 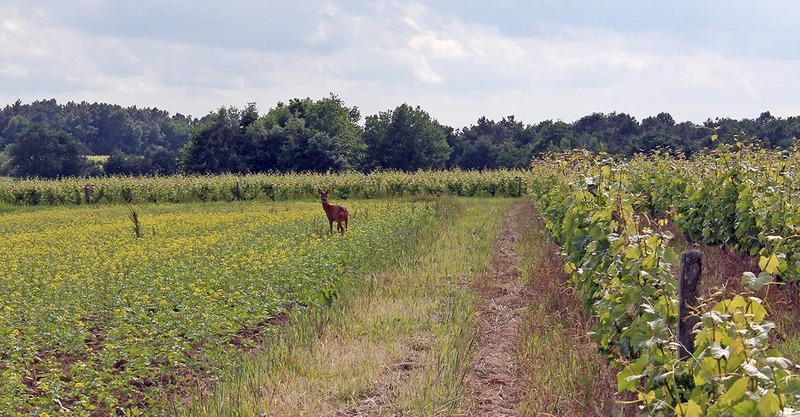 The growers use electric fences and colored tape around their vineyard parcels in the spring to help keep the deer from nibbling the grape flowers, with mixed success. Summer is under way, but summer temperatures still elude us. We've had some nice days, but the rule has been cool, overcast, and wet. On the plus side, I haven't had to do much watering in the vegetable garden. But the seedlings need some sun and warmth now. Callie inspects the plot of winter squash seedlings. Actually, I think she's munching on grass. They are growing, albeit slowly. I can see the progress. I just know it would go a little better with sunshine. If I remember correctly, we had a late start last year with the same kind of weather. The squash plants didn't produce much, but we had a decent tomato crop in the end. And speaking of tomatoes, there are dozens of "volunteers" popping up out there, no doubt from seeds that either ended up in the compost or from "dropped" fruit during the growing season. I'll wager most are cherry tomatoes because there were so many of them last year. I guess I should let some of them grow to maturity to see. You can't see what's in the pots, but it's all good stuff. On Saturday we ate leftover Brunswick Stew served on bulgur wheat. I made hush-puppies (deep fried cornbread) to go with it all. 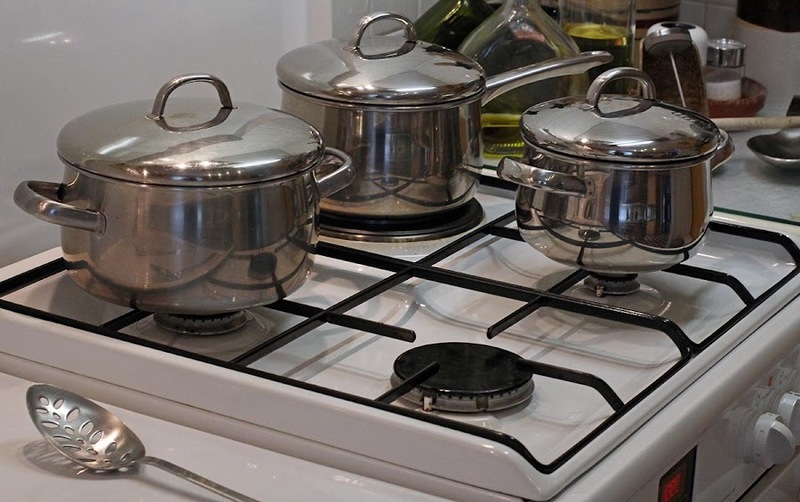 One of those pots has the stew, another the wheat, and the third contains the oil in which the hush-puppies would be fried. Our pots from Macy's, still serving us well in France. Ken and I got these pots (and more) at Macy's Union Square in San Francisco back in the eighties. The Macy's brand back then was called "Tools of the Trade." They have served us well ever since. To infinity, and beyond! It may sound strange to talk about the central heating on the first full day of summer but, with the current cool temperatures, we're this close to needing it. On Friday, we had our regularly scheduled visit from the company that maintains the oil-fired boiler that heats our house in the winter. We contract with them to provide annual maintenance, emergency service, and to sweep the chimney once a year. A variety of wild rose after the petals have dropped off. The boiler is over twenty years old. It's a German model, and way over-engineered. Some of the programming features no longer work, but we've found out that they're way too costly to replace, so we have to operate the thing manually. That means turning it on and off when we want to control the heat output; there's no interior thermostat. The thing was designed to sense the outdoor temperature and adjust the indoor heat accordingly (and who thought that up, anyway?). One day it will have to be replaced, then we'll have to decide whether to stick with heating oil or go with another technology. That's a decision I'm not really looking forward to making. Kinda. Sorta. According to the calendar, today is the summer solstice. But our spring weather continues: overcast, breezy, showery, and cool. And the forecast is for even cooler temperatures through the weekend. Joy. Wild bellflowers on the edge of the vineyard. 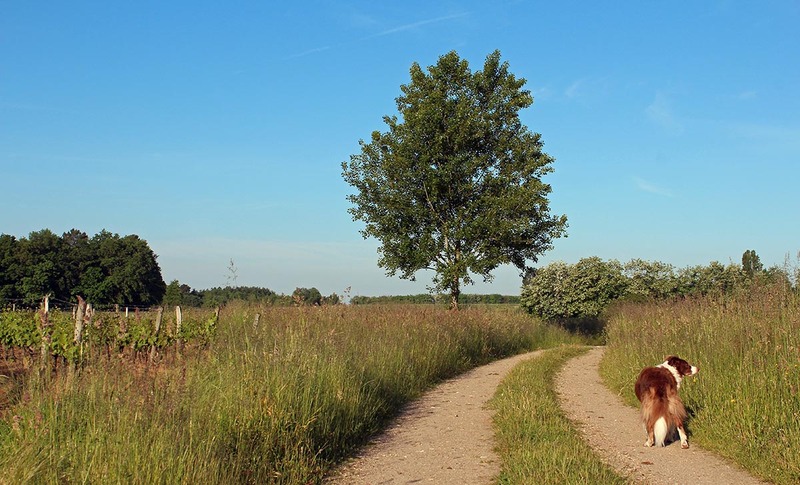 The wildflowers are doing their thing in the fields and woods and around the vineyard and everything is very green. Northeastern France (and by extension Germany and much of eastern Europe) has been suffering under a heat wave with temperatures in the thirties (around 90ºF). Consequently, they've been having serious thunderstorm activity with big hail and high winds. There's been a lot of damage up there in the past day or so. And in the southwest, they're dealing with bad flooding due to rain and snow-melt from the Pyrenees. Our mild weather doesn't seem so bad compared to all of that. We had some serious rain on Wednesday but (sound of knocking on wood) thankfully the kitchen ceiling didn't leak. This could either be because it didn't rain hard enough (although I thought it did at one point) or because the last roofer to look at the problem moved the tiles around and cleaned out some accumulated debris. Or because of both. Acacia flowers while they were blooming. They're all gone now, with the wind and the rain. We have since hired that roofer. We signed the estimate and sent him a deposit and now we're waiting for him to schedule the work. It will be nice not to have to dread every rainstorm that comes our way. Especially this year, as they seem to come in succession. 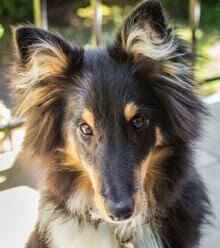 When the Vélux roof windows got fixed last year, we felt a huge load of stress evaporate. Every time it rained, the drywall around the windows would soak up water like a sponge. Goodness only knows what was going on inside the wall with the insulation. But that's all repaired now and we haven't seen any dampness there since last year. I'll be glad when I can say the same about the kitchen ceiling. About half of the houses in our hamlet are named. At least, their names are written on them in a script made of twisted iron. I think that the names had their origin in the days before the houses were numbered. Among the names here are La Ruine (The Ruin), Bella Vista (Italian for Beautiful View), Les Bouleaux (The Birches), and La Grange (The Barn). This is one of our neighbors. It's a vacation house that's used maybe two weeks out of the year. Our house is the one named Les Bouleaux. Mail sometimes comes addressed that way, without the house number. Mail is also delivered if it only has our name with the hamlet's name on it, as long as town name and the postal code are correct. 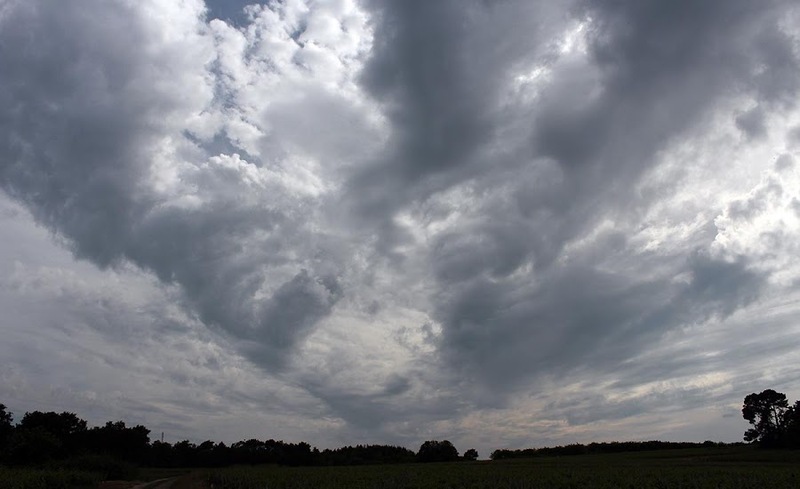 Our skies have looked like this most of the spring. This was Sunday. At least it wasn't raining, like it is this morning. We had rain most of Monday afternoon after a dry morning and it rained off and on through the night. It's supposed to continue for another forty-eight hours. A dramatic sky over the vineyard out back. Pretty, but I'd rather have sun. So I had several piles of trimmings from the forsythia shrubs to deal with on Monday morning. Rather than chuck them all into the woods to decompose or pile them up in a corner to burn this fall, I decided to sharpen the blade on the yard waste chipper and reduce it all to mulch for the compost pile. Worked great. That's about all I got done outside before the rain started. These aren't the best of photos, but they document what I got done on Sunday. This is the largest of the two forsythia bushes in our back garden. I got out there with the hedge trimmers to neaten them up. I think that I should have trimmed a lot more aggressively now that I see the photos, but it's good enough for now. I read that the time to trim forsythia is right after they flower. Now is the time. Both of the bushes had grown so large that I couldn't get the lawnmower around and under them. Happens every year. The large forsythia just before I trimmed it. I needed a ladder to reach the top. The second bush is next to that first one, to the left out of the picture, but it's about a third of the size. I think a fungus got to it and it wasn't as healthy. Last fall, Ken poured a bleach solution on the roots and that seems to have helped it. And the result. Not small enough, and a little lop-sided. Maybe next year I'll get it right. 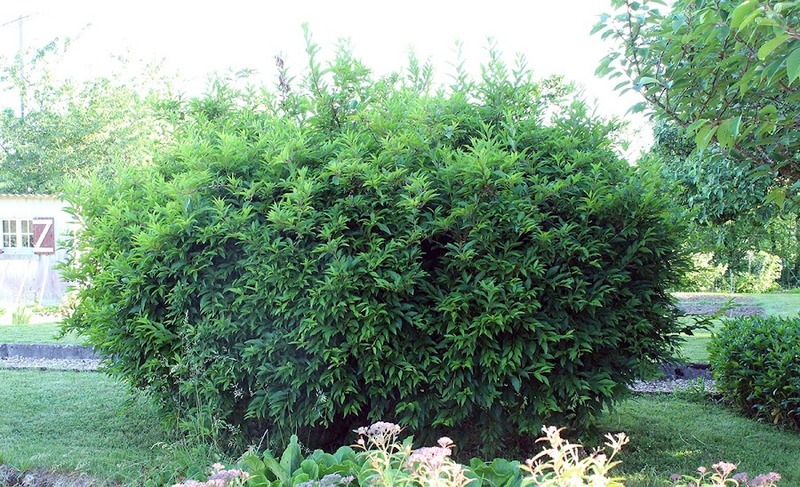 I also took the hedge trimmer to the juniper bush that grows on the north side of the house. 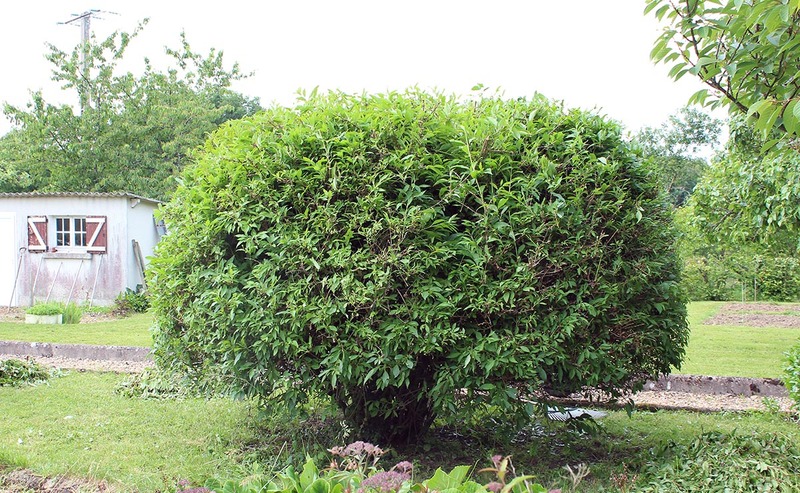 It's a large round shrub and the spring growth gets in the way of cutting the grass. So, every year I have to cut it back. Done for another year. Yay! Here are some little peaches growing next to the vineyard to the north of our house. Someone who lives outside our hamlet owns the land they grow on. We see him from time to time out there clearing the ground around the trees. Other people (his family?) sometimes come up in the summer to pick fruit. I'm hoping to get out this morning to trim two forsythia bushes that are getting out of control. There's a two-hour window on Sundays for using noisy power tools (town rule). The trimmer is electric, so it doesn't make too much noise. Spring is one of the, wait for it, Four Seasons. Rim shot. 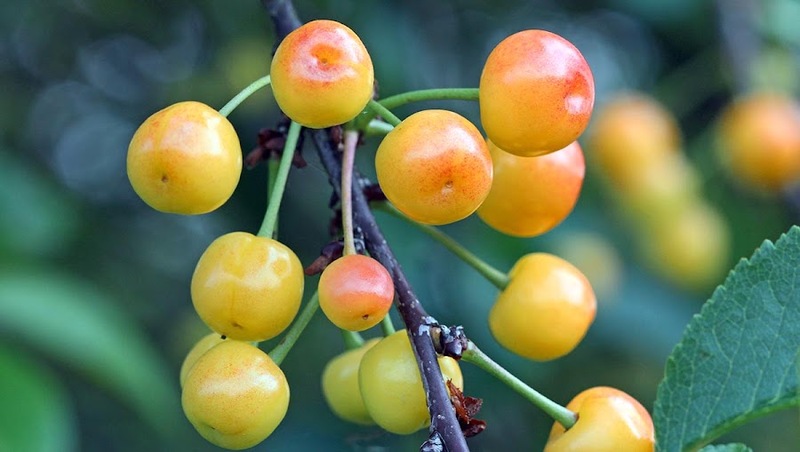 You may remember that last year was a lousy year for fruit. 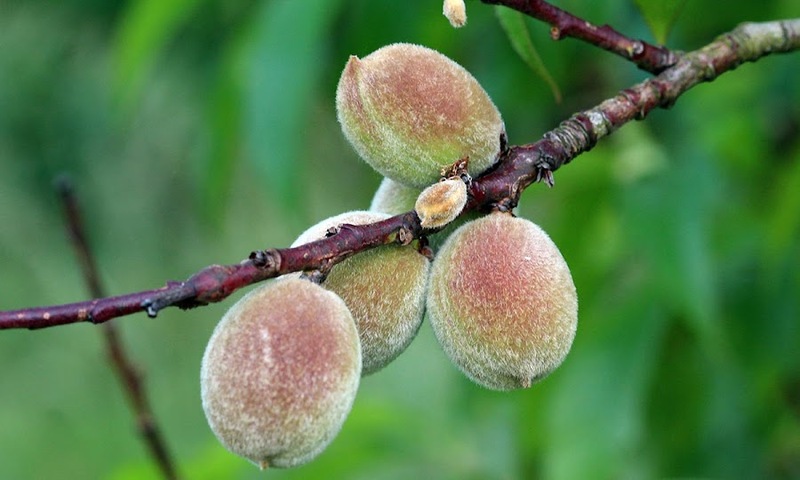 We had no apples on our trees and peaches and cherries were rare. Well, this year seems back to normal. The blossoms have been abundant and now we're seeing the fruit. Young cherries just starting to ripen. 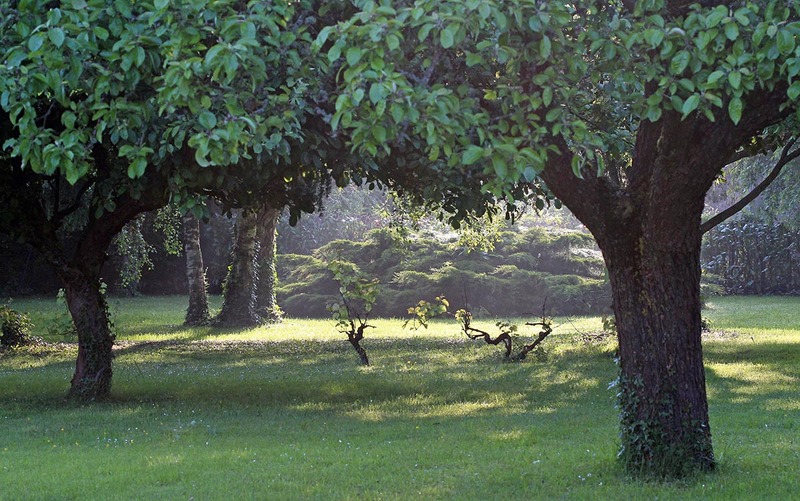 Our apple trees are covered with little apples and the peaches, plums, and cherries that grow around the neighborhood are looking good. Maybe we'll be able to pinch a bit here and there. There are some trees that don't seem to be harvested so sometimes we get some of the fruit before the birds do. 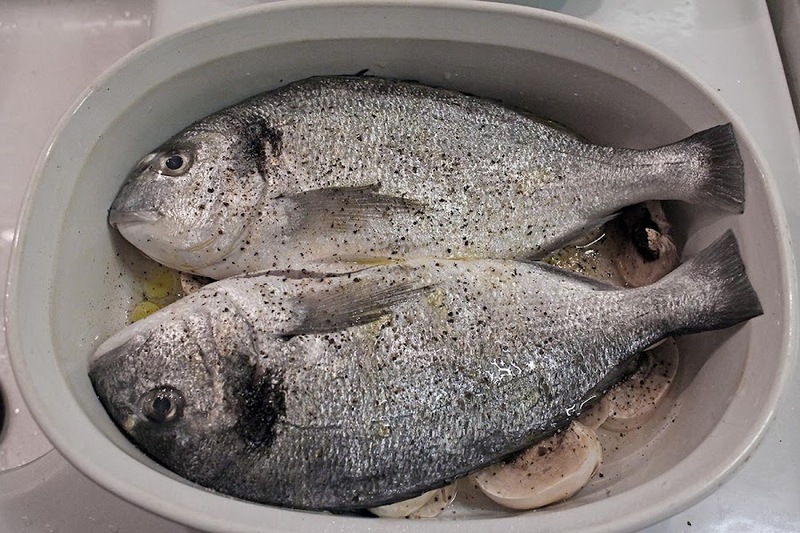 The sea bream, or dorade royale in French, is mostly a farmed fish these days. It is, however, still caught in the wild throughout the Mediterranean Sea and in the coastal waters of the Atlantic from north Africa to Britain. These two were pulled from the seafood stand at our local supermarket. Two dorades, just under a kilo, ready for the oven. We cooked them whole in the oven on a bed of sliced mushrooms with olive oil and white wine. The flesh is delicate and tasty and comes off the bone easily. We served it with millet, one of my favorite grains that's surprisingly hard to find here. Ken recently found some in a local health food store. Like that would be something new. We're expecting more rain mid-day today. I think the drought they've been talking about for the last nine years is officially over. Water tables are above normal and the ground can take no more. Reservoirs are full. Rivers are flooding here and there. Think happy thoughts. 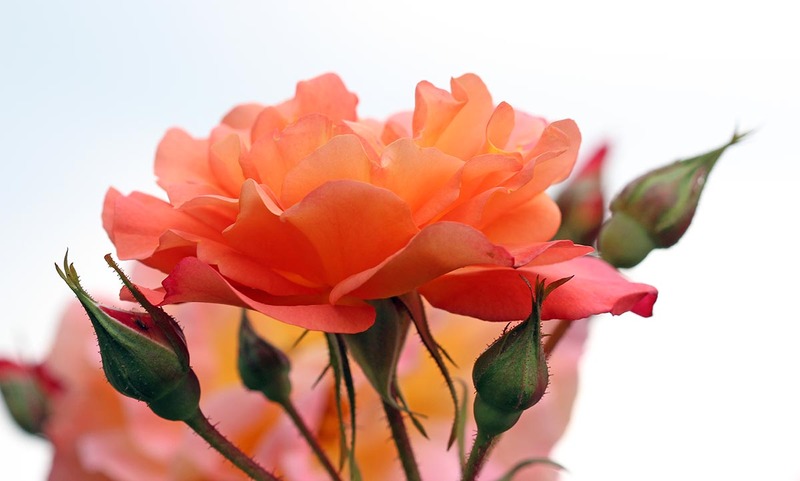 A pink-orange rose in a neighbor's garden. The background is actually the overcast sky. I hope my newly planted tomato seedlings don't drown. And I hope our roof doesn't leak (and it shouldn't, unless there is a particularly strong downpour). We will be on "alert status" through the day, ready with the plastic tarps and buckets, just in case. We can't do email or make phone calls with it, but our blackberry gives us fruit. If the critters don't gobble it up first, that is. We don't get much, it's a young plant and only produces a handful of berries. It's a variety without thorns, given to us by a friend from across town. 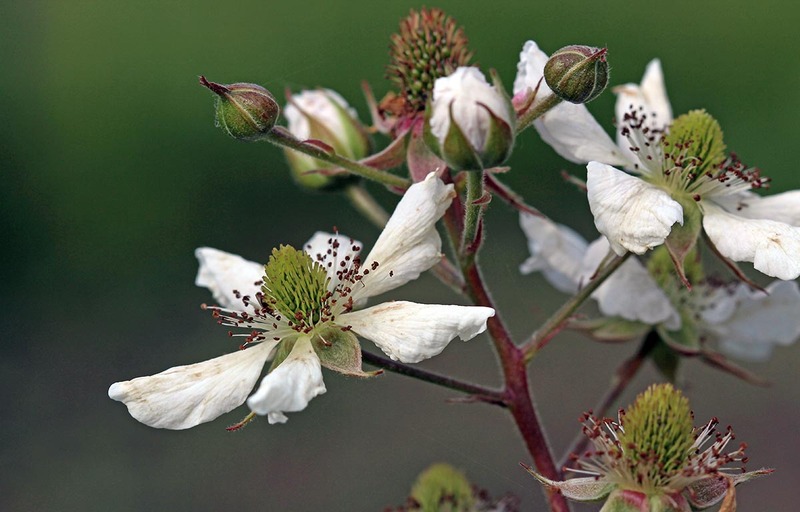 The blackberry is blooming now. She gave us a few canes a couple of years ago and Ken planted them out by the back fence. Only one survived, but it looks like it will do well where it is. Our weather continues to be overcast with showers. I got sixteen of our twenty-four tomato seedlings in the ground yesterday. I dug holes, hauled compost from the compost pile to the garden plot and filled the holes, then planted each seedling directly in the compost. The garden soil is mostly clay that is very hard to work when it's wet, even after nine years of being worked and amended. I'll get the rest of the tomatoes in the ground today. On Monday's walk with Callie, I encountered Bert in the road. From a distance. 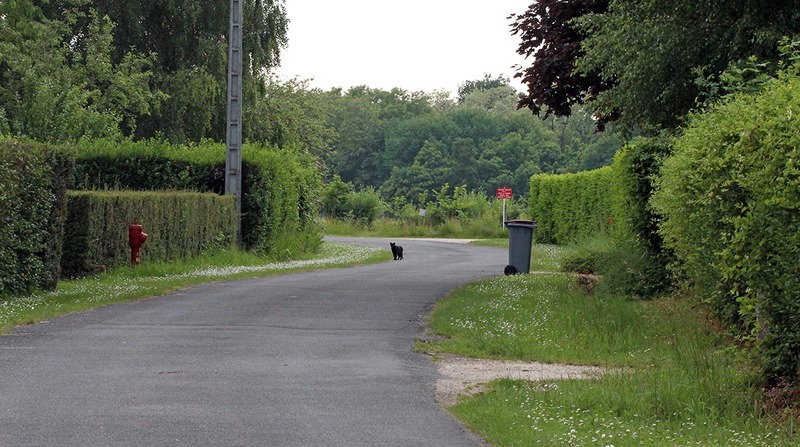 Callie never saw him as she had turned off the road into our neighbors' property. I snapped this photo then followed her. We didn't see the cat again; he stealthily made himself scarce. The lens creates the illusion that Bert is closer than he was. He kept still while he watched until we were out of sight. Our temperatures have dropped into the teens (sixties fahrenheit). It feels cold after last week's mini heat wave. I'm running out of photos. The camera is not getting a workout. I've barely left the house. On the nice days this past week, I was either working in the garden or socializing. And watching tennis on television. That won't end; we're moving into grass court season. English tennis and all that rot, what. 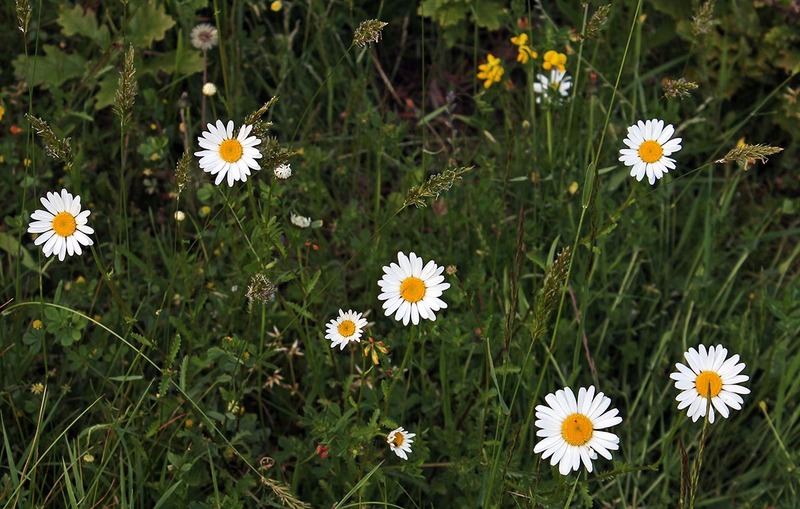 Daisies smiling up at me. I'm still trying to finish planting the vegetable garden. The tomato seedlings still need to be set out. Maybe today or tomorrow, depending on the rain. I got some marigolds into the ground on Sunday. Hip, hip, cheerio! We had a spectacular week. Saturday was cloudy, but warm, and it rained overnight. The women's final in Paris went without a hitch and it was a fun match to watch. I'm glad Serena Williams won; it's her sixteenth Grand Slam title (wow!) and she spoke French in her interviews and to the crowd in her trophy acceptance speech. Nothing wins the hearts of the French crowd more than a champion who speaks French. 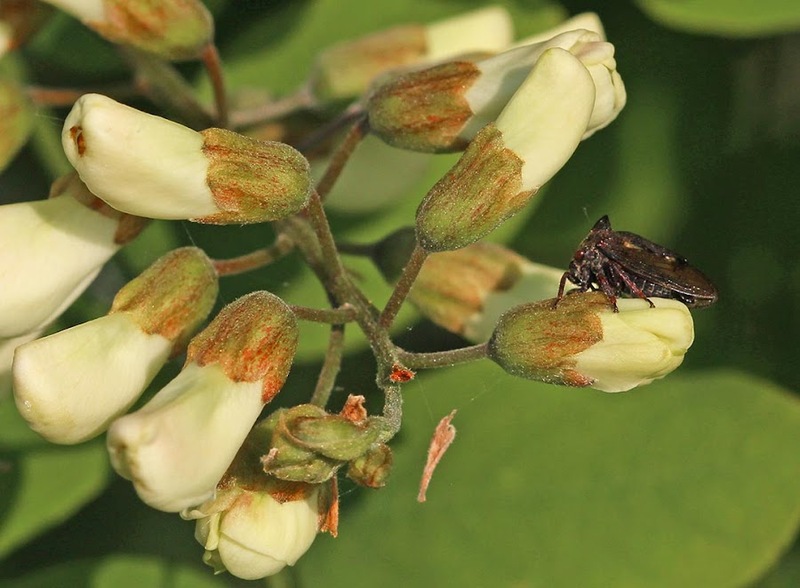 A ferocious looking insect rests among acacia flower blossoms. Today, the weather is a bit more iffy for the men's final. We woke up to overcast and fog and we're expecting showers off and on during the day. I want to get my tomato plants set out in the garden. I'll have to play it by ear. Normally someone comes (the town, I think) to cut this patch of grass down before it gets this tall, but it hasn't happened yet. It's a patch of grass between two vineyard parcels and now it feels like a narrow corridor. This is what it looked like on Friday morning. The grass is taller than the vines (on the left). The nice weather continues, at least through today before it cools off a bit. We've seen some thunderstorms pass in the distance but haven't had any here. Yet. We had a second roofer visit us last evening. The first one came and told us he'd give us a call with his price, but we haven't heard from him since Tuesday. The latest guy said he'd send an estimate by email. He diagnosed the problem consistently with all the other people who've looked at the roof, so we feel pretty confident we know what the issue is. Now if we could only get someone to do the work. We'll see. 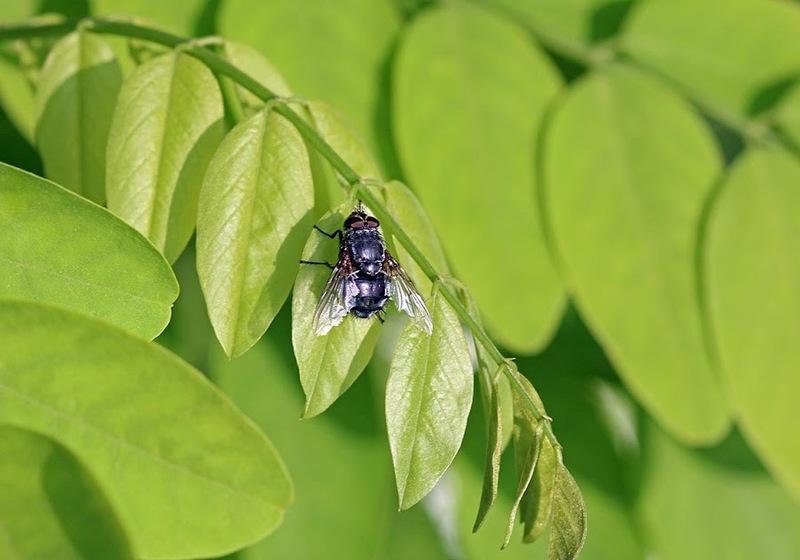 This looks like a common house fly to my untrained eye, sunning itself on a branch of fresh acacia leaves. Today is men's semi-final day at Roland Garros. Two very interesting matches up: Nadal/Djokovic and Tsonga/Ferrer. I've also been enjoying a little of the senior/"old" players tournament. I'm glad they televise the matches, giving us a chance to see some of our favorite players from the past. I've seen Michael Chang, Henri LeConte, Guy Forget, Mats Wilander, Martina Navratalova, and John McEnroe, among others. Good fun! Wednesday was a beautiful and productive day. I did some weeding in the vegetable garden, along with some watering. I cleaned out the planter boxes for the deck and got the petunias planted. I cut the grass and did other little things here and there. All this while Ken made lunch (he'll talk about that later). Morning sun on the north side of the house. The two trees in the foreground are apples. We got up to 24ºC (about 75ºF) and enjoyed clear skies most of the day. After lunch, I put tennis on television and sat out on the deck. It almost felt like summer. During the night I heard the pitter-patter of light rain on the roof. Today I have a few more garden errands I want to accomplish before lunch. And it's women's semi-finals day at Roland Garros! Believe it or not, we're moving into a period of warmer weather. It's not hot (and it likely won't be), but the temperatures are climbing slowly into spring. There's even the threat of evening thunderstorms. It's about time. Of course this means that we have lots of chores to do outdoors. 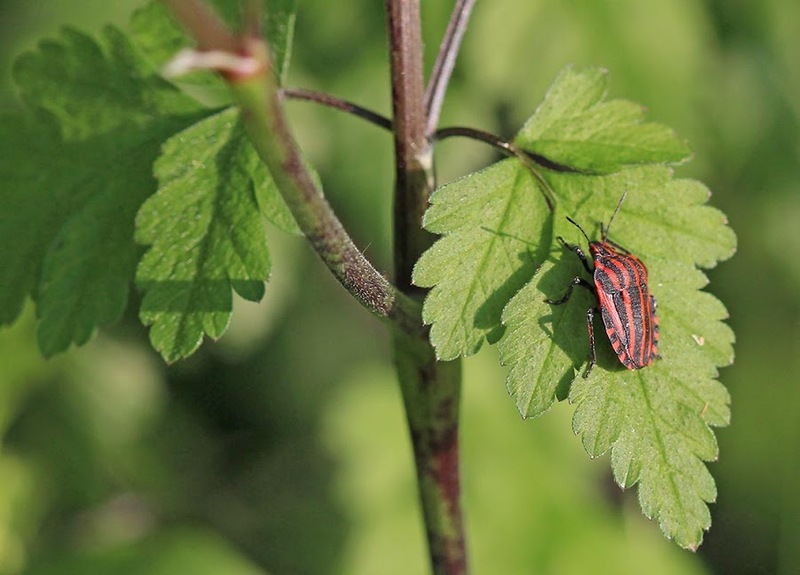 A red-striped beetle sunning itself on a recent morning. Yesterday I got the kitchen window boxes planted with surfinia, a cascading petunia. I've got some standard petunias to put in flower boxes for the deck, but I've got to clean said flower boxes before I can plant in them. I've got more seeds and seedlings to get out into the vegetable garden. And today I've got grass to cut. They're probably not edible, anyway. 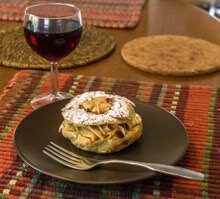 We went to a small party on Monday afternoon, hosted locally by some friends of fellow blogger "ladybird" who's in town visiting. It was a lovely day, one of the best we've had recently, and we sat out in the sun most of the afternoon. 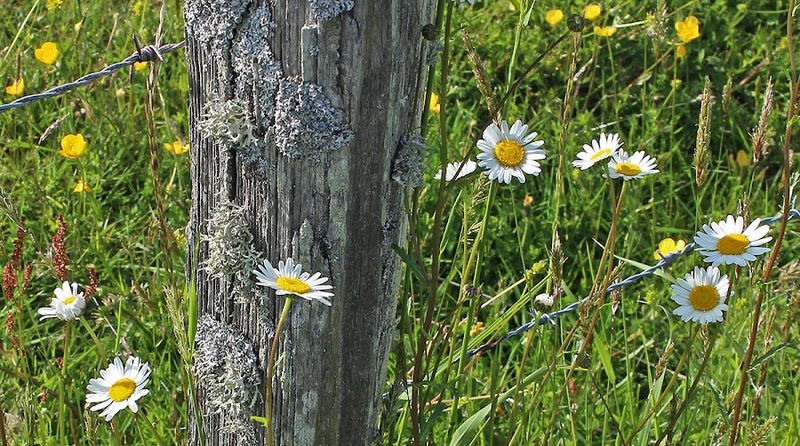 Daisies growing along the fence around the donkey meadow. We came home with light sunburns on our faces. Not one of us thought that we'd have that problem, given all the overcast we've had recently. The forecast for the next few days is for sun and warmth, with temperatures in the low to mid-twenties (mid-seventies, in fahrenheit). That will be very nice, indeed. At least, I think this is what this is. I don't know if it's a female or a male since I never saw the wings folded out. On the male, the outside of the wings is a beautiful blue color (hence the name). 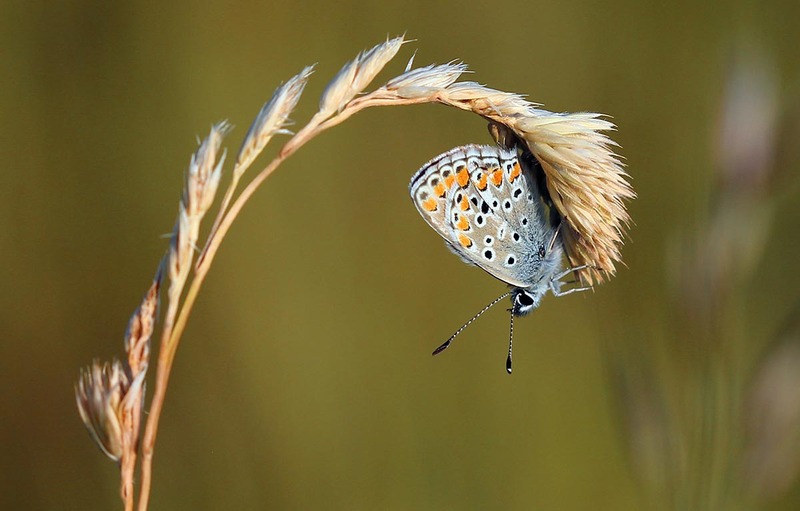 In French, it's called a belargus or adonis bleu or azuré bleu céleste. This little butterfly sat perfectly still for me in the early morning light. This one was sunning itself in the early morning. Probably too early for it to flit around. I wonder where they spend the night? In other news, I met a neighbor from down the road during my evening walk with Callie. We've seen each other to wave for a couple of years now; he has a jack russell terrier that Callie recognizes. Yesterday we happened to be on the road at the same time. After a little walking and talking, I mentioned the roof issues we've been having. "Well, I'm a roofer," he said. So he's coming by on Tuesday morning to take a look at our roof. How about that?! That's what I saw this morning. I was jarred awake by Callie barking wildly at the bedroom window. She took off after a few seconds down the stairs, then I heard the familiar whoosh! of a hot-air balloon's burner. I was skeptical, since the sky was overcast and balloons normally only fly in clear weather. 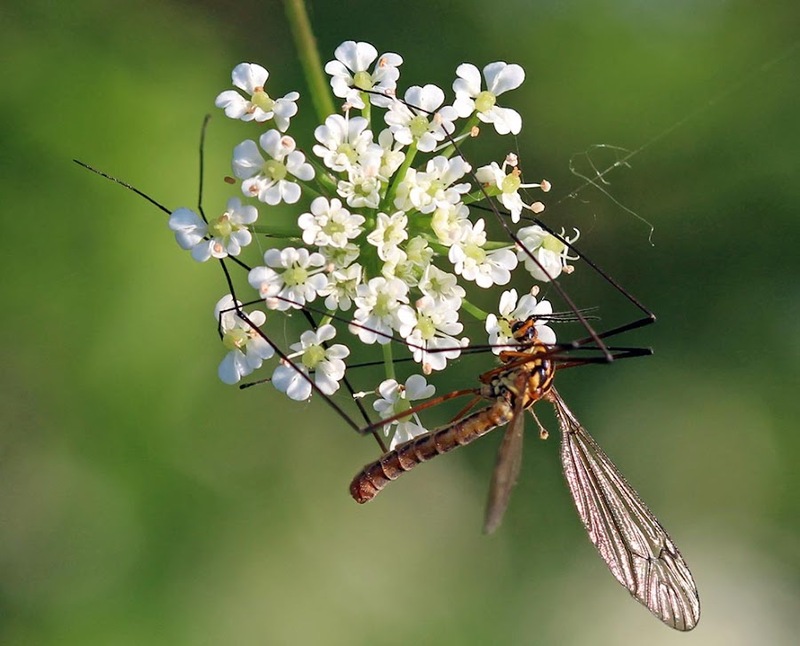 A crane fly warming up in the morning sun on a flower head. Looking out the window (which is on the second floor, or third if you're in the US), I saw a huge red and white balloon coming straight for the house through the trees from the north. It got larger and larger and I swear the basket was going to hit the treetops outside. The balloon rose up and over the house, but just barely. I threw open the skylight shade and looked right into the eyes of the pilot as he and his single passenger glided above me. My camera was downstairs, so I got no photos of the slender balloonist with the piercing blue eyes. In keeping with the wet weather we've been having, here are some rain-soaked campanules (bellflowers) in our yard. These are planted in our vrai faux puits (the real fake well) out back. They're doing well (pun intended) this year. 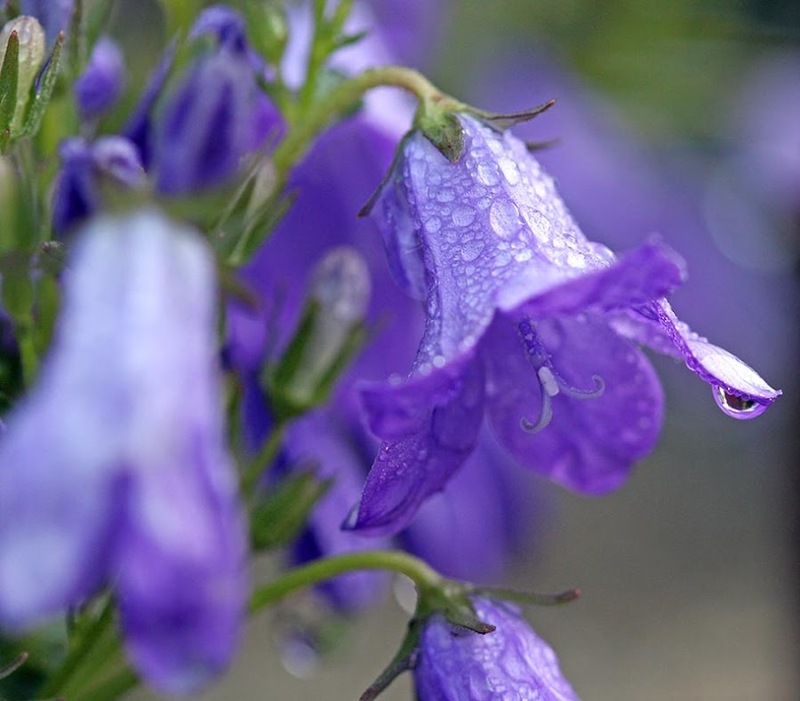 Raindrops on bellflowers, no whiskers on kittens. The reason, I think, is that it's been cold and wet enough that the mint, which is also planted in the well, is coming in very slowly. That allows the campanule to grow and not be crowded out by the otherwise aggressive mint.